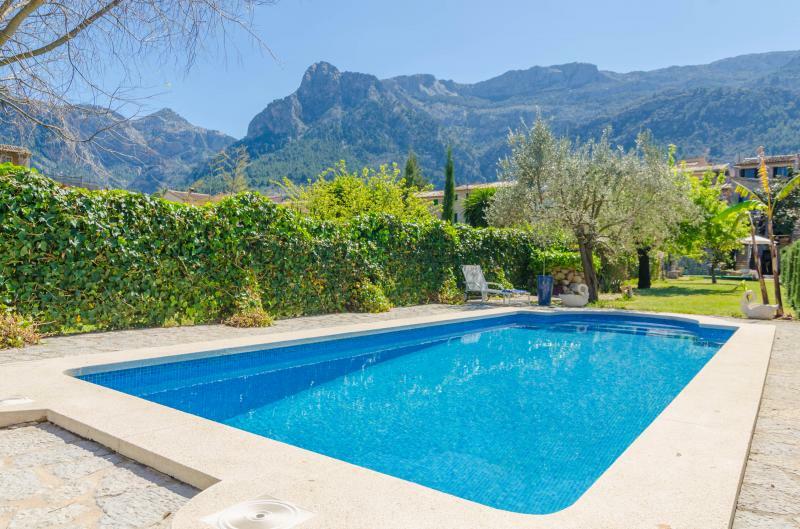 In the 5m x 4m private chlorine pool with a depth ranging from 1.1m to 1.5m you can swim while contemplating the mountains. After a refreshing bath in the pool, you may lay down on two sun loungers and read a good book. An exterior kitchen with BBQ is ideal for those who like cooking outside. 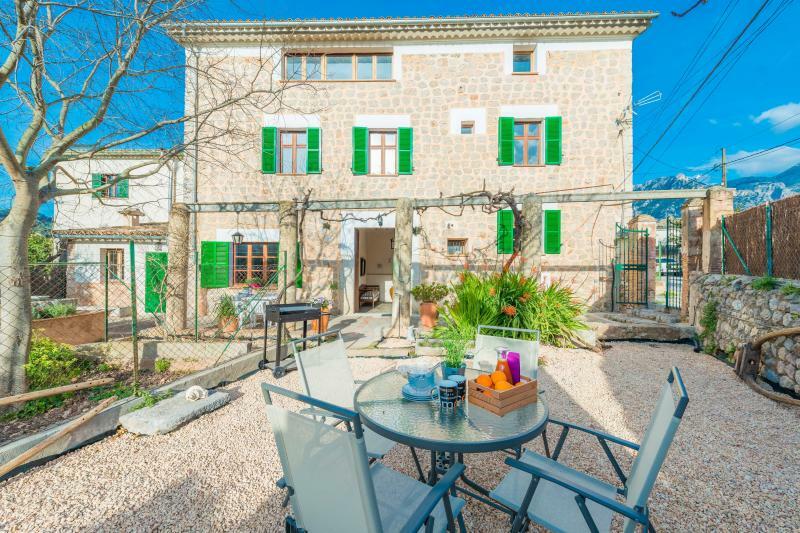 A terrace is great for al-fresco dining and has views to Fornalutx and Biniaraix. The plot is fenced and there are a few neighbours. The interiors are composed of a cosy sitting-dining room with open kitchen, A/C and satellite-TV. We can prepare a sofa bed for two additional guests. The kitchen is fully-equipped, including an electric hob. Furthermore, there's a laundry with washer, iron and ironing board. The bedroom counts with two twin beds, a fan, a wardrobe and an electric heater for the colder months. We gladly supply a cot and a high chair for our youngest guests. A few minutes' walk takes you to the picturesque centre of Sóller, declared as a World Human Heritage by Unesco. The most emblematic building is the church of St Bartholomew and its first historical record is dated back to the year 1236. 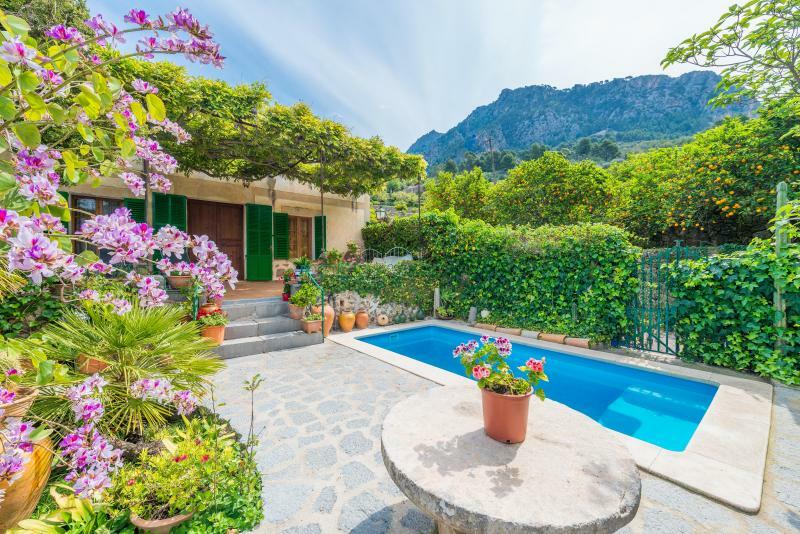 Sóller has good restaurants, supermarkets, cafés and everything else you may need for an independent stay. By tramway or bus you can go to Puerto de Sóller, a coastal town with a sand beach, bars and shops. In the surroundings you'll find lots of cycling routes and trails. The most famous and maybe the most beautiful excursion is a journey by the old train from Sóller to the capital Palma, past romantic landscapes and genuine villages. The beaches of the mountains are mostly rocky and surprise with cool and clear waters. Just to mention a few: Llucalcari, Cala Deià and Port des Canonge. Through wild-romantic winding roads and small paths you can explore the mountains by car, foot or bicycle. A car is essential.